Released on Friday 1st February, we catch up with filmmaker Robert Kilburn to find out more about Broken Window, with the film focusing on the North East graffiti scene. 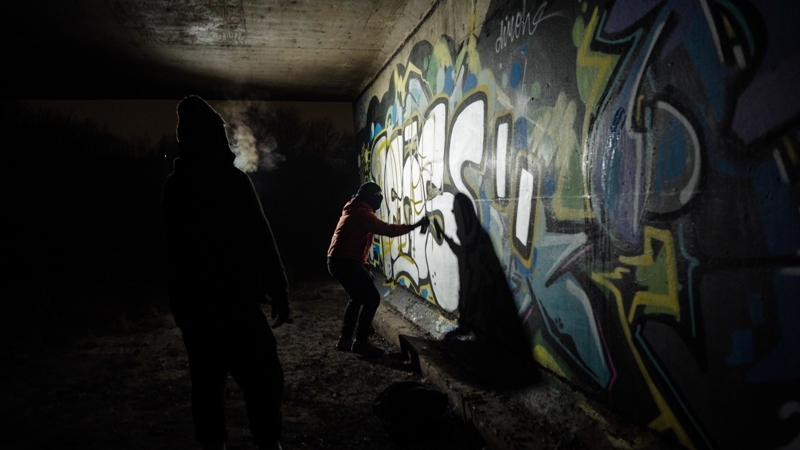 Our latest documentary, Broken Window, looks at the graffiti scene in the Tyne and Wear county. Speaking to and following the writers giving them the opportunity to express their opinions on the legality of graffiti and vandalism. This will be the fifth short documentary I have directed with others focusing on the parkour scene in the North East, paranormal investigations, a stuntman and my first attempt at filmmaking which focused on a zoo which was in Seaburn during the 1970s. The first story I took an interest in, Seaburn Zoo and Janet Coghlan who was mauled by a tiger there, has undoubtedly had a large impact on my choice of story and the creation of Tyne and Weird as a whole. Even now it seems strange to think that there was once a zoo with lions, tigers and dolphins along the seafront in Sunderland. I began looking into this in 2014 roughly a year after the feature length documentary Black Fish was released which had kindled my interest in the idea. While I had no real experience filmmaking prior to this it didn’t hinder my determination to speak to people about its history and eventually reach Janet herself who was happy to speak to me about her experience at the zoo and the impact of being mauled by a tiger at 13 had on her. I had initially hoped the film would get in at Sunderland Short film festival but the quality really wasn’t there so I decided I would go to Sunderland University to learn and develop some real skills. The most recent documentary Broken Window takes its name from the sociological theory which argues a broken window leads to more crime and that is something people often say about graffiti itself. I’ve worked in a lot of different call centres, relying on public transport to get there, and I would constantly see it everywhere and in some pretty hard to reach places. I hadn’t seen anyone actually doing it in person and it made me wonder who these people are and what motivates them. Researching to build on this idea I found a lot of documentaries on graffiti tend to focus on the “is it art is not“ kind of argument which is something I was keen to avoid deciding to focus on the legality of it and their motivations instead. In the U.K there aren’t a huge amount of metro systems like the one we have and it draws people from places all over Europe to the U.S who come over to paint our trains and streets which is something I hadn’t realised before looking into the subject. This is by no means the first documentary on the graffiti scene in the North East but I wanted to make it stand out by giving the writers themselves a chance to really voice some opinions as it isn’t exactly something you can speak publicly about. Initially it was hard getting in touch with people in the scene, as an outsider, people are rightly suspicious of you and your motivations however the more people we met the more interest grew in the project. I think everyone has their own idea of what/who a graffiti writer is but throughout filming everything I thought I knew changed as each person we met was different and did it for different reasons. One concern was that the film could end up being outright pro graffiti and morph into a film that would fall into the sub-genre of graffiti films as opposed to documentary but the more we met writers and captured their diversity it provided lots of different talking points which at the end leaves the audience to make up their own mind. Luckily I have some really talented people working with me like Lewis Dodds who runs Dodds Film and has been at the core of this film as well as Tom Lee who has worked on the local music scene with Spotlight Music U.K. Since announcing our next documentary project on the North East rave scene, focusing on Sunderland in particular, the response has been overwhelming. I think there are few people in the county who aren’t aware of either the Blue Monkey, New Monkey or haven’t attended some of the other big clubs in the North East that are now sadly gone. Something I have always wanted to work on was a documentary made largely of archive footage which became especially true after watching Wild Wild Country released on Netflix last year. There is some great footage out there of the big clubs in Tyne and Wear and we have already had people lining up eager to tell us about their memories and stories of attending these places. This was an idea I had immediately after the Seaburn Zoo documentary but I wanted to wait till I was more skilled and able to do the film justice which I’m confident myself and Lewis can now do. We have decided to bring forward the release date of Broken Window to January 20th to get a head start on working on this next project due to its size. There has already been some archive footage of the New Monkey and Hangar 13 collected which as far as I can tell isn’t available to watch online anywhere yet and I’m excited to share. Be sure to follow the Tyne and Weird YouTube Channel and Facebook to watch Broken Window and keep up to date with news relating to our other projects.